Easy, chocolate-y and perfectly decadent, these grain-free chocolate hazelnut cookies are the perfect treat when you're craving something sweet. These Grain-Free Chocolate Hazelnut Cookies are so easy, it’s almost a sin. 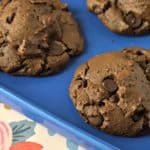 Since a batch only makes 12 cookies (you could double it, of course, I don’t judge) and they’re packed with fiber, I feel these cookies are a healthy-ish treat too. Disco. The cookies are chewy, with a brownie-like consistency in the center. Perfect for my 3pm chocolate fix, or anytime I’m craving. Give these a try, I’m pretty sure you’ll love them. 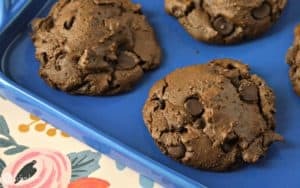 This entry was posted in Baked Goods, Dairy Free, Desserts, Grain-Free Goodness, Paleo Friendly, Recipes and tagged celiac, chocolate, dairy free, g-free diet, G-Free Foodie, gluten free, gluten free baking, gluten free diet, gluten free snacks, grain free, nutella. Bookmark the permalink.